Failure at Hill 70 and Retirement. At 9am on the 26th, a combined attack by units of the 15th Division and 21st Division on Hill 70 met with no success. The enemy’s artillery, which had been augmented during the night, heavily shelled the advancing troops and included, under this fire, the back areas as far as North Maroc – gas shells being used to a considerable extent on both the old German and British front line systems. Further north, attacks by the 21st and 24th Divisions collapsed and, following a German counter attack, a retirement became general. The southern flank of this retirement swept through Loos, involving units of the 45th Brigade (15th Division) and, carrying with it, the exposed flank of the 19th Battalion – since that Battalion received an order to retire, which was passed down the 45th Brigade line. The remainder of the 19th Battalion, however, stood firm. 45th Brigade communicated with Brigadier General Thwaites’ 141st Brigade a message to the effect that it could not hold Loos any longer and was retiring on to the old German front line. The position of the 47th Division at this stage – between 9am and 12 noon – was critical. The advanced left flank of the 141st Brigade and some of the 19th Battalion holding on to the Loos Crassier and the Chalk Pit was “in the air”. The London Irish Stand Firm. The northern flank of the Division, held by the London Irish, was completely exposed, there being a gap of about a mile extending northwards from the left of the Battalion almost to the front of the 1st Division. A large number of men, hurriedly withdrawing, continued to pass through the Battalion’s line in spite of efforts to check the movement. When the tide of the retirement was at its height, Colonel Tredennick and the Adjutant, Captain AP Hamilton calmly walked about in the open, the latter with his head bound up and blood stained bandages showing through his torn breeches. They exhorted the London Irish to stand fast and the Battalion, gathering up fugitives where possible, stood to arms and refused to budge, awaiting the expected German attack with angry confidence. At this period, the Battalion formed the rock on which the Division’s safety rested. Had they been drawn into retirement, not only would the immediate consequences to the Division have been very serious, but the prospects of the continuance of the entire scheme of operations would have been jeopardised. 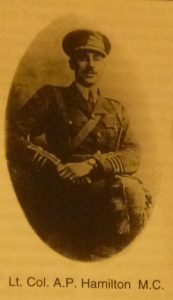 Brigadier General Thwaites, with keen insight into the situation, advanced his Headquarters to the Valley Cross Roads and ordered the 23rd Battalion, which had been placed at his disposal by the GOC Division, to extend to the left of the London Irish and, by 1250pm, this movement was executed, the left flank of the 23rd Battalion resting on the Grenay – Benefontaine Road. Orders were given for all positions to be held at all costs and units were informed that reinforcements were coming up. The necessity for keeping a firm grip on Loos was obvious and two regiments of the 6th Cavalry Brigade (Brig General Campbell) were ordered forward. By 4pm, these troops were passing through the lines of the 141st Brigade and Loos was soon reoccupied. The Cavalry assumed responsibility for the close defence of the Loos and took up a line on the north and east of the town. The critical period was at an end but, had the Germans resolutely followed up their advantage by pressing on the heels of the retiring troops, the northern part of Loos might have been retaken by them and a considerable area to the north made good. During the night of 26th/27th September, it was bitterly cold and heavy rain fell. The troops, already tired and weary and without their great coats, were again soaked to the skin as they continued their work on the improvement of the line. Some hot tea came up during the night and, although lukewarm when distributed, it was the first hot food available since the night of the 23rd/24th and was received with cheers. Consolidation continued throughout the night, a good deal of wire was put out and the trenches, occupied by the Battalion were completely fire stepped and finished to a depth of seven feet. Although the night was fairly quiet, there was a good deal of tension as a heavy German counter blow was expected. The enemy still held a part of the Copse on the high ground to the right and was making good use of his position there. From the Copse, machine guns fired across the captured area, making all movement in the open hazardous and, at frequent intervals, the enemy signalled to his artillery by firing coloured rockets. The enemy’s occupation of this ground was a thorn in the side of the Division and preparations were made to eject him. Information was received that the Guards Division was approaching with the intention of assaulting, at 430am, Puits 14 bis and Hill 70, and it was decided that the attack on the Copse should synchronise with this movement. A bombardment of the Copse, commencing at 230pm, was carried on all the afternoon by the 40th Howitzer Battery (Major Dollard). The shooting was extremely good and the troops rejoiced to see the heavy Lyddite (high explosive) shells bursting on their target. The enemy was far from quiet. There was a good deal of rifle fire from the Double Crassier and the enemy guns searched the Division’s area while Loos and the supports were heavily shelled with high explosive and shrapnel. At 450pm, the Guards attacked and their orderly advance in the face of severe shell fire evoked un-stinted admiration of the men watching. At the time, a rumour was current that the Guards had requested the CO of the London Irish to permit his Bombers to join in with them, but no definite information on this point is available. As the Guards progressed, the opposition became increasingly severe and, on the crest of the hill, the attack was stopped by heavy machine gun fire and the troops dug themselves in. To the north, the assault was pressed as far as the Lens – La Bassée Road where consolidation was commenced. The 47th Division’s attack on the Copse, organised by Lt Col Hubback of the 20th Battalion and Captain Thorne, the Brigade Bombing Officer, was made by the Grenadier platoon and one Company of the 23rd Battalion, assisted by the remnants of the 17th and 19th Battalion’s Bombers and was completely successful. The intricate maze of terribly battered trenches, covered with yellow Lyddite powder and with 200 Germans lying dead there, gave a striking testimony to the devastating power and accuracy of the preliminary bombardment. There was a good deal of excitement during the attack occasioned by the messages, which filtered back. There were frantic calls for bombs, more bombs, reserve bombers and eventually, after dark, a call came for any bombers. Believing the situation serious, Lt Dircks collected a party of the London Irish Bombers and hurried forward. On arrival at the Copse, the situation was found to be fairly secure but the efforts of the troops to consolidate were being hampered by snipers lodged in a group of houses on the hill. The London Irish bombing party crawled out towards the houses but were called back on two or three occasions by shouts indicating counter attacks. .Later, the London Irish Bombers went forward to protect the working party from risk of surprise attack but as sniping continued, they finally crawled forward again through the long wet grass to within a few yards of the houses, and cleared the enemy with salvos of bombs hurled through the broken roofing of the houses, Cpl Peake getting in some particularly effective shots. Later, the same bombers, under the leadership of an RE officer, crawled along the trench, from which the Germans were sending up artillery signals, and pushed back the enemy for a considerable distance. At midnight, the Division’s front line was secure. The left flank was in touch with the Essex Yeomanry astride the Loos Crassier and the Yeomanry were, in turn, in contact with the Guards on the western slopes of Hill 70. On 28th September, the situation remained unchanged on the front of the Division. The troops were wet through and dog tired but, before relief, had to submit to a continuous shrapnel bombardment the whole day long. Instructions were received for the Battalion, on relief, to reoccupy the old front line trenches from which the advance commenced but this arrangement was subsequently cancelled and orders to proceed to Les Brebis substituted. In pitch darkness and a deluge of rain, the relief commenced at 9pm (on the evening of the 28th). To obviate congestion, relief was carried out in the open – men falling in with their companies behind the trench, as their relief jumped in. By 945 pm, the 22nd Battalion had taken over and the London Irish were clear. It was a desolate region that the Battalion passed through on their way back. The roads were in a bad state and the sides were littered with a pitiful debris of dead men, horses and wrecked transport. By 1030pm, the Battalion was assembled in billets in Les Brebis and, very soon, the men had fires blazing and their sodden clothing hung out to dry. The following day, 29th September, was spent in cleaning up and reorganising. Returns of killed and wounded were prepared from which the Battalion’s losses were put at about 300 killed, wounded and missing, “A” Company alone having 98 casualties. On 30th September, the Battalion paraded at 930am and moved off a quarter of an hour later en route for Hesdigneul. The Battalion arrived at its destination at noon but, owing to billeting difficulties, the men were not fully accommodated until 4pm. 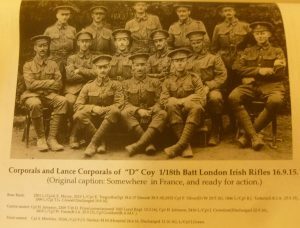 Chapter 3 – In and Out of the Line at Loos.